Well after a disastrous Saturday session for Lewis Hamilton, Sunday proved that you can never write the Brit driver off. 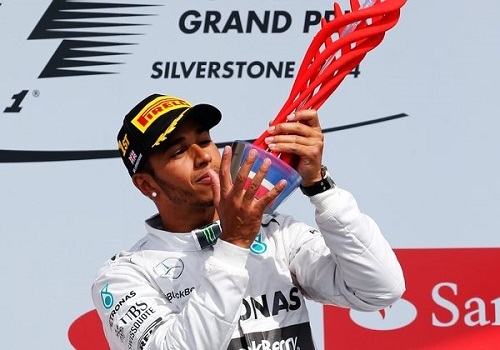 Despite abandoning his last qualifying lap, and looking deep into the depths of despair that evening, Lewis came back stronger than ever to finish on the top step of the podium, a huge win for him and for the British public who were so desperately seeking solace in their “summer of British sport”. Hamilton was lucky though in that his teammate Rosberg’s gearbox ceased working, causing him to retire from the action-packed race, and preventing wheel-to-wheel racing between the two Mercedes’ who are arguably head-and-shoulders above the rest. Valterri Bottas finished on the podium again for Williams Martini in a fantastic second place, although half a minute behind Hamilton. Daniel Ricciardo continued his superb run for Red Bull finishing in third place on the podium. Jenson Button narrowly missed out on the third place podium, which would have been his first ever British Grand Prix podium, much to the disappointment of the watching fans decked out in #pinkforpapa gear. The race was punctuated by the dramatic crash of Kimi Raikkonen when he slammed his Ferrari into the guardrail after just four corners, narrowly missing Felipe Massa, and suffering a 47G impact as a result. Fernando Alonso and Sebastian Vettel had yet another whinge session on-track about missing grid-lines and driving out-of-bounds, although by this stage I am not sure why we are still surprised about this. For all their combined world titles and driving skill, deep down inside they can still behave like little boys 😉 Vettel finished the race in fifth, with Alonso sliding in behind in sixth. Kevin Magnusson also had a strong showing for McLaren, and came home in seventh place followed by Nico Hulkenberg and the two Torro Rosso’s rounding out the top ten. So it would seem then that past the halfway mark in the season, that Mercedes are still the team to beat – mechanical problems aside, and the rest of the teams are still playing catch-up. Red Bull seems to have found some inspiration, whether it is in the form of the Aussie Ricciardo, or whether they have just found some speed, and I hope that Ferrari, Lotus and McLaren can find that same inspiration. We all want to see more wheel-to-wheel racing, and as long as Mercedes are driving away from the field, it’s the only thing that’s missing. Failure of the day: Kimi Raikkonen for trying to get back within track limits in a dangerous area, and endangering not only himself, but also the lives of other drivers around him. One of the few times I have been grateful for a Massa spin.